Only showing entries about architecture from A Longwinded Journey South. View entries about architecture from all Travellerspoint blogs. Itamar Sela (one of our hosts at Organizmo) worked for a landscaping company in New York City after he finished his three year Landscape Design degree at the New York Botanical Gardens. 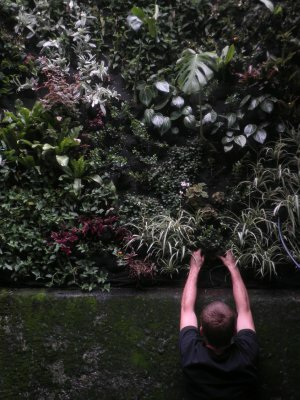 The majority of the large companies work in the city was centered around green walls and Itamar was first introduced to them there. 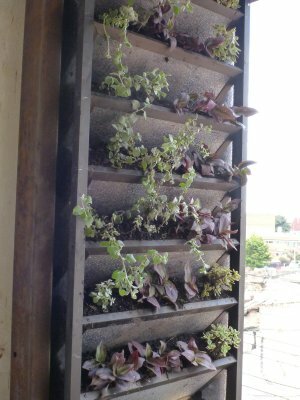 After moving to Colombia with Ana Maria he began constructing his own green walls and incorporating them into the buildings they constructed. 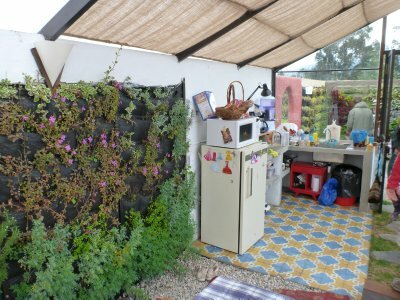 Itamar experimented with different materials, structures, arrangements, and plants to find what worked best in this new climate and in different settings. 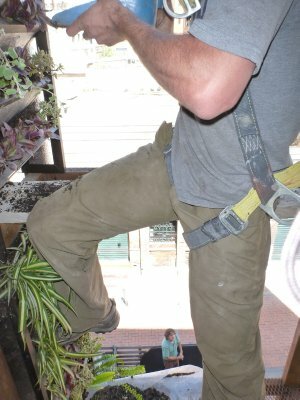 Itamar began his own landscaping company that in just over two years employees eight people. A year or so into operation he decided that the business was spending too much on pots and planters so he set up his own concrete forming shop run by one guy churning out planters from various molds. 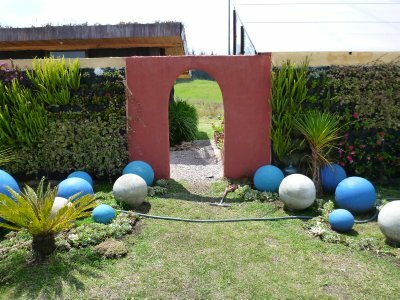 He has also set up a base for business operations in Bogota where he grows seedlings for his projects in a small greenhouse and displays the planters for clients to choose from. 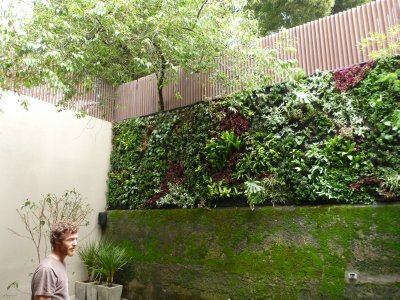 Itamar remarked that greenwalls have become fashionable in Bogota and there are more and more requests for them. From hydroponic systems of timed watering and fertilization in high-class courtyards to stacked planters watered by hand, greenwalls can suit any environment, budget, or aesthetic. The two basic categories seem to be either pouches or planters. 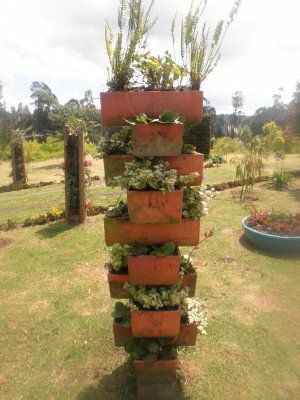 Normal rectangular planters (window boxes would work but they don't have many things made out of wood here) can be stacked in such a way to allow plant growth from exposed portions to form a living pillar, or specially designed walls of angled planters allow plants to grow outward and upward. 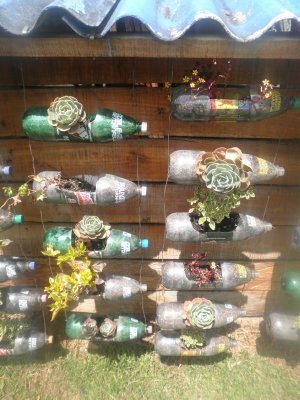 One of the workshops for the Climate Champions of Colombia at Organizmo was constructing hanging chains of large soda bottle planters for an even 'greener' effect. The pouch method involves a fabric or geotextile as they call it here (landscape cloth or filter fabric at home) of two or more layers made into pouches filled with soil and plant material. 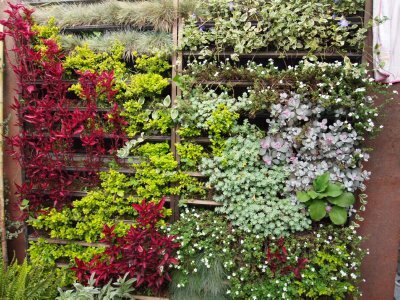 Greenwalls are ornamental constructions just like most landscaping and flower gardens but their ingenuity lies in their use of space and ability to provide greenery and life in confined places. 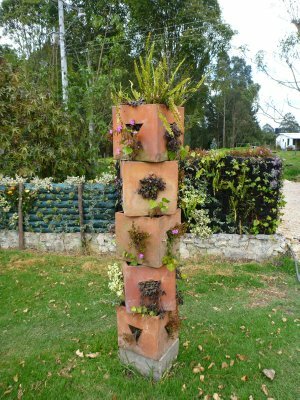 The design aspect for planting such a vertical surface turns traditional garden design on its head (or side rather) so that it becomes something more like a composition or living painting. I have been most impressed by the idea of using this technique for herbs. 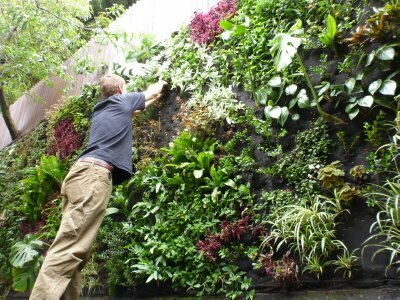 Both aesthetic and useful, whether for cooking, teas, or live aroma, herb walls can merge artistic design and practicality just as the best gardens, landscapes, architecture, and ceramics do (in my opinion). Picking prime leaves from a wall is simply easier and more space efficient than picking from a bed, pot, or planter. Throw in the novel and often advantageous shielding effect of such a barrier and the ease of watering and weeding, and herb walls seem destined to become a more familiar sight in cities and towns around the world.